The US election is dominating news coverage around the world, in part because of the gender-related themes it has surfaced. In just two short weeks, the US might elect its first female head of government. If so, it would join 13 other countries in the world – Bangladesh, Bosnia and Herzegovina, Chile, Croatia, Estonia, Germany, Korea, Liberia, Lithuania, Malta, Marshall Islands, Mauritius, and the United Kingdom – that are currently headed by a female leader. Out of the 144 countries in the Global Gender Gap Index this year, only 65 have ever had a woman in the country’s top job in the last half century. But political empowerment for women is about more than just about one person. It also includes representation in ministerial roles, national legislatures and local governments. 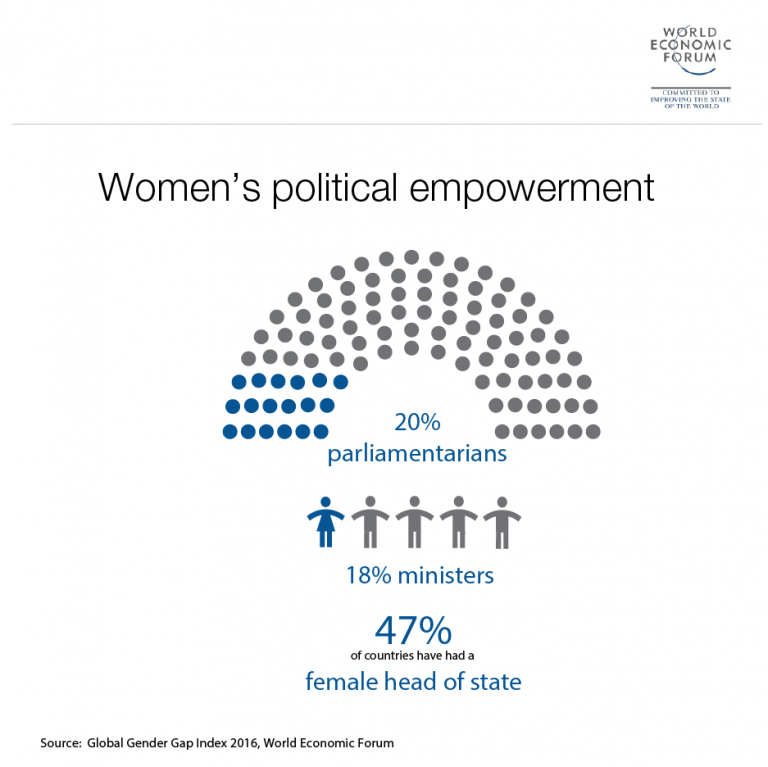 Globally, women hold on average only 24% of the ministerial positions that men hold, and only 27% of the parliamentary positions. It’s a low bar, but one that the United States misses, with only 1 in 5 members of Congress and only 1 in 4 cabinet members women. As an emblem of democracy around the world, and a byword for innovative, economic power, this is an imbalance that poses considerable challenges to the future prosperity of the nation. Before we consider the benefits the US could accrue in terms of inclusive, sustainable economic growth from re-balancing opportunity between the sexes, it is worth considering the current direction of travel. Back in 2006, the country ranked 66th in our index on political equality. Now it’s at 73rd because, even though it has narrowed its gender gap in politics during this time, other countries have moved ahead faster. 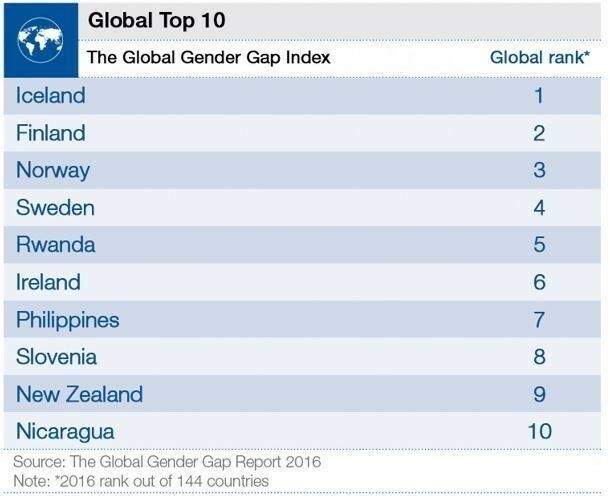 The top 10 countries in this year’s Gender Gap Report – with the US nowhere to be seen. Economic gender equality has also been in steady decline in the US. A decade ago, the US ranked 3rd globally in this area – today it ranks 26th in the world. During this time, although women’s labour force participation has gone up (from 60% in 2006 to 67% today), the numbers are much higher in several advanced and emerging economies. For example, in China, women’s labour force participation stands at 70% today. The earnings gap has also stalled for the most part, from women earning 62% of men’s incomes back in 2006 to nearly 65% today. The US ranks a low 50th globally on this indicator. I find these economic and political gender deficits particularly paradoxical because they rest on a base of talent that in fact favours women. Nearly 89% of Americans aged below 24 get some form of tertiary education, and within this group, women outrank men 4 to 3. To some extent, American companies already recognize this vast pool of talent: more women than men hold professional and technical roles in the country. But those women do not make it into senior, higher paid roles in the same proportion, with only 43% making it into legislator, senior official and manager positions. What’s more, this leadership gap is getting wider, having started out at 46% a decade ago. To catch up with other countries, the US will need to focus on both economic and political gender equality. This is not just the right thing to do – it’s also the smart thing to do. Why is this important for the US economy and US society in general? Balanced female representation in politics pays off for countries broadly, well beyond specific individuals who find themselves in positions of political power. First, the “role model” effect, which is felt by both women and men, changes biases, aspirations and perceptions about women in leadership. Second, diversity leads to better, robust decision-making, both in the workplace and in politics, because it takes a wider range of views into account. Third, it has been shown that in countries where there are women in political leadership, economic inequality is low, both between income groups and between genders. When women are in power they make, in part, decisions that are representative of other women’s needs, whether that’s better water infrastructure in a rural area in India or better care policies for families in an advanced economy like the United States. The rationale for closing the economic gender gap is even more obvious. If women are the majority of the skilled talent in a country, ensuring that this talent pool is fully tapped for economic growth will be critical for sustained competitiveness. For the past decades, increased education in the US has been matched by an influx of women in the workforce and many barriers have been dismantled along the way. But a new paradigm is upon us and it will require a more strategic approach to gender equality. The Fourth Industrial Revolution is changing business models, jobs and skills across all industries and all countries, bringing both challenges and opportunities with it. Ensuring everyone benefits from the opportunities will require fresh ideas and diverse thinking. This certainly means ensuring that women are prepared and ready for growing professions, such as STEM-based roles, but it also means that everyone – man or woman – gets the same opportunities in the economy broadly. The US is not alone in representing a society where unpaid work is still seen as the responsibility of women, with women performing more than three times as much of this work as men do. Some of this is cultural but much is structural. But where the US does stand alone is the fact that it remains the only advanced country in the world with no national parental leave policies. It is no surprise that the topic has been more visible than ever before in this election – both single income and dual income families have reached a breaking point. Without broader care infrastructure, the US may well stay stalled in gender equality – and by extension, growth. But despite being behind many other advanced economies on this agenda today, the US could leapfrog ahead of others in the future by learning from the best examples in the world. For example, many advanced economies first went through the process of introducing maternity leave before instituting paternity leave as the benefits of gender balance in care became evident. Similarly, many countries have begun to realize the benefits of some public incentives and regulation to manage the expansion of a professionalized care workforce. The US has ample opportunity to learn – and to skip ahead directly. No matter who is in charge after 8 November, they will need to contend with making gender equality in America great again – and ideally, greater than it ever has been.